This was a great new find to add to my tween fantasy books! White captures a twelve-year-old girl's voice perfectly with Sara. She is spunky, full of life, and looking for adventure. I enjoyed her frequent travel back to Ancient Egypt, and an interesting new perspective on the life of Cleopatra and her people. Sara doesn't expect her desire to travel to distant lands to be fulfilled in her grandmother's attic. 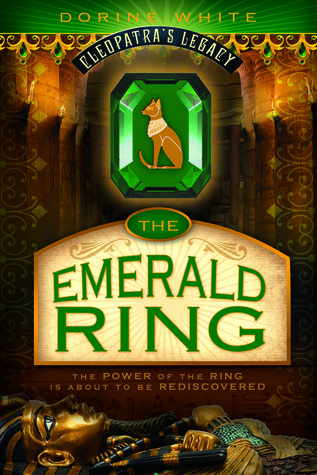 But when an old emerald ring transports her back to Cleopatra's Egypt, as a cat, she finds adventures can be a bit more dangerous than she thought. Sara's zest in chasing after the thief terrorizing her neighborhood, and her desire to help her new friend from Africa make her a likable character. I found myself holding my breath a few times with her narrow escapes and near misses. Tweens and their parents will enjoy this history and magic-filled tale of ancient cults and brave new heroes, and felines.